Where can I purchase tickets for the garden tour? Tickets can be purchased at Baltimore Woods Nature Center, Chocolate Pizza at 3774 Lee Mulroy Road in Marcellus, Rolands of Skaneateles at 14 E. Genesee Street, Auburn Public Theater at 8 Exchange Street in Auburn, Metro Home Style at 689 N. Clinton Street in in Syracuse, Side Hill Farmers Meats & Market at 315 Fayette Street in Manlius, Bailiwick Market & Café at 441 NY-5 in Elbridge, and Ballantyne Gardens on Hopkins Road in Liverpool. Is there a discount if I purchase my tickets ahead of time? Yes, advance sale tickets are $6 each if you purchase by May 5th. On May 6th, the price changes to $12 each. Tickets will be available to purchase at all ticket-selling locations and at the gate the day of the event. Purchasing tickets in advance saves you money and reduces your wait time at the gate. Can I pay for the tickets by credit card? Tickets can be purchased online at www.baltimorewoods.org via credit card or in advance by cash or check at the off-site ticket locations. At the gate, guests may pay via cash, check or credit card. Where does my ticket/admission fee go? 100% of your admission fee goes to support Baltimore Woods Nature Center in its mission to connect people across Central New York to nature through year-round, on- and off-site environmental education programs tailored to the public, school children, groups and scouts. Can I get a refund if it rains? Tickets to the garden tour are nonrefundable as the event is a fundraiser for Baltimore Woods Nature Center. The good news is that the gardens are lovely, even in rainy weather and so the event will take place rain or shine! Who owns Sycamore Hill Gardens? Sycamore Hill Gardens is privately owned by the Hanford family. Originally a fully functioning dairy farm with over 300 head of registered Jersey cattle, the Hanfords have worked diligently for twenty years to transform pastures and cornfields into a magnificent 40 acre showcase of nature’s beauty. Most recently, the Hanfords have planted over 10,000 native trees, 10,000 native shrubs, and planted 180 acres of ground nesting bird meadow mix as part of the USDA Conservation Reserve Program (CRP) to restore farmlands, reduce erosion and runoff, and promote the habitat of indigenous wildlife. Additionally, these practices have prompted local Marcellus bee keepers to set up their hives within the CRP land and work toward keeping healthier, happier, honey bees and supplying an abundant source of pure local honey. 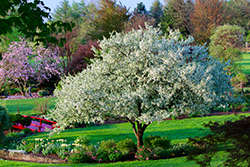 For more information, contact the Hanfords at karen@sycamorehillgardens.com. How long will it take to tour the gardens? Guests should plan to spend at least 2-2.5 hours in order to see all of the amazing features of this impressive property. Parking is made available at no cost in the field across the street from the garden tour. Is the garden accessible for those with mobility concerns? The gardens are expansive, but stone dust paths provide generally level walking surfaces through portions of the gardens. For guests who cannot walk long distances, a golf cart tour will run throughout the day. Chairs are available near the front gate for guests who would like to wait for the golf cart. Limited seating on the cart is available, and so we ask that guests limit their golf cart party to those needing assistance plus one additional family member. Can I bring food into the garden with me? You are most welcome to bring a picnic basket with you! Will there be food available for purchase? The Chicken Bandit food truck will be at Sycamore Hill from 11am-4pm and those who opt to purchase food can choose from a delicious lunch menu featuring their famous “bandit seasoned” chicken along with other tasty items and beverages. Can I bring my dog to the garden tour? We’re sorry, but we ask that you leave your pets at home. They will not be allowed to enter the gardens. Can I pick the flowers? The owners of the garden are happy to allow guests to pick three flowers to take home. Is the garden open other times of the year? Yes, Sycamore Hill Gardens does open several times a year, for the benefit of local nonprofit organizations. 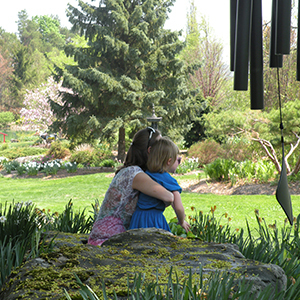 Please visit www.sycamorehillgardens.com for more information on upcoming public events at the garden.